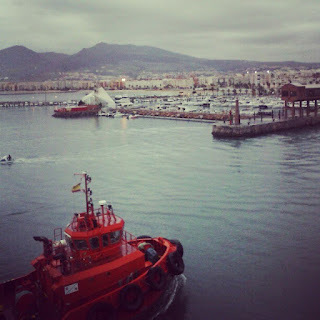 While traveling between Spain and Morocco over this spring’s Semana Santa vacations (Easter break), I took ferries between the Spanish cities of Almería and Algeciras to two more Spanish cities on the coast of North Africa: Ceuta and Melilla. Yes—little exclaves of the Kingdom of Spain sitting on the other side of the Mediterranean Sea, two outposts of Europe in Africa. Before I got interested in Spain a few years ago I had absolutely no idea these geographic oddities existed, but Ceuta (pronounced “THAY-OOH-tah” [ˈθew.ta]) and Melilla (pronounced “may-LEE-yah” [meˈli.ʎa]) are just as much Spain as Barcelona, Bilbao, or Burgos. They don’t belong to any Autonomous Community (think Andalucía, Galicia, Cataluña…) but are Autonomous Cities responsible for all their own affairs. There’s really not much to see and do in these towns, and I wouldn’t go out of my way to visit them apart from passing through for transit between Morocco and Spain. Still, they’re fascinating little cities that make great pitstops while traveling. Additionally, while being 100% Spanish (siesta, language, etc. ), people of Arab heritage make up a significant part of both cities’ population—so they’re almost transition zones between Spain and Morocco. When the ferry from Almería arrived here in the blue hour just before sunrise, Melilla looked very mysterious, an almost-colonial outpost glittered with streetlamps and surrounded by brooding hills. It had rained during the night and the cold weather was hardly what I was expecting “Africa” to be—but as the sun rose, the rainwater merely glazed the streets. I had a typical Andalusian-style breakfast of toast, olive oil, grated tomato, and salt with a café con leche, and ordered it while speaking Spanish. Later, for Second Breakfast, I had chocolate con churros…with Moroccan mint tea. Yes, in Melilla the churrerías will give you the option to order coffee OR tea with your churros. I loved it. After breakfast, I felt like I was back in Barcelona because of all the Modernista-style buildings that dotted the city from the main plaza to the residential neighborhoods. 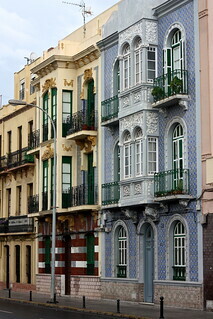 And with good reason—Antoni Gaudí’s protégé, Enrique Nieto, designed almost 500 buildings in Melilla. How did it become Spanish? In 1497, the Catholic Monarchs (Ferdinand & Isabella) requested that this strategic location be conquered. 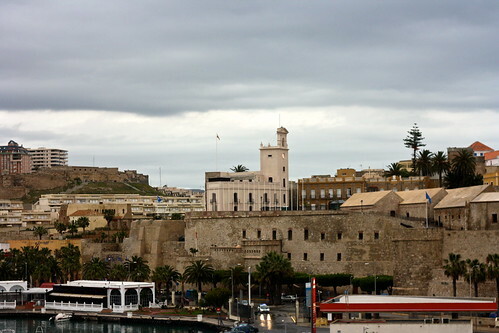 After that was carried out, a fortress was established that would form the historic core of Melilla. It was later attacked every so often in the centuries to follow, and sieges never finally ceased until Spanish troops gained control of the region as part of the Spanish Protectorate of Morocco in the early 20th century. Until the ’90s, it was actually administered as part of Málaga province. Is it worth visiting? Apart from a museum here, a church there, and a fort you can walk around, Melilla didn’t stand out as the “next hot destination” for me. It did, however, make the transition between Spain and Morocco much more comfortable: I had a few hours to wake up slowly, take my time, and finally catch the bus to the border crossing, which to me (despite the craziness) felt much more relaxed than a direct Spain to Morocco ferry would have. How do you get there? Leaving from Spain, hop on the next Iberia flight to the Melilla Airport (MLN) or take an (overnight) 8-hour ferry from Almería or Málaga. From Morocco, take the train (or a grand taxi) to the border town of Beni Ansar, which is right outside of Nador, both about 6 hours from Fez. Scammed of all my dirhams (Moroccan currency) and fresh out of euros when I crossed the border from Moroccan Fnideq into town, I basically just had to hoof it from the border up to the main urbanized section, or about 4km. There were literally no ATMs until I got to the old town, so I had no money to pay for a taxi or a bus. Blech. But, back in Western civilization, I was back in the game after getting some McDonald’s (probably not our finest work, Westerners…) and some cold, hard, cash. I quickly realized I didn’t have nearly as much time there as I thought I would because Spain is one hour ahead of Morocco (and two in the summer), so there was just enough time for a late lunch and some quick snapshots. I was really surprised how many Spanish flags were hanging from apartments all across town. Perhaps this is in protest to the Moroccan government’s claims of sovereignty over Ceuta and Melilla? 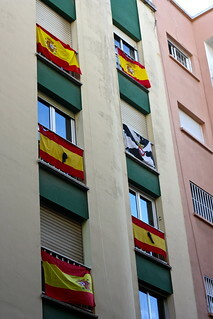 Rarely do you see such nationalistic flag-hanging anywhere in Spain, and if there’s any flags to be hung from apartment balconies it will be the Catalan or Basque independence ones, not the national flag. 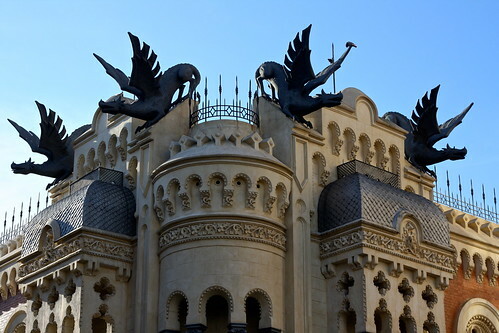 In the heart of the city, I ran across the pretty freakin’ cool Casa de los Dragones. This “House of the Dragons” was built in a mish-mash of Mudéjar revival and 19th-century designs with four dragon statues capping the roof. Very crazy but very fun. How did it become Spanish? You might think it’s a holdover from Spain’s days as a colonial power in Africa—but Ceuta has actually been Spanish/European longer than such European cities as Almería, Málaga, and Granada. In 1415, Portugal won the city—which had passed from kingdom to kingdom over the centuries. When Portugal and Spain (then Castilla-Aragón) were ruled by the same king from 1580 to 1640, Ceuta also became Spanish, so much so that it remained part of Spain after Portugal regained its independence. On the city’s coat of arms and flag, you can still see the Portuguese cross featured prominently. 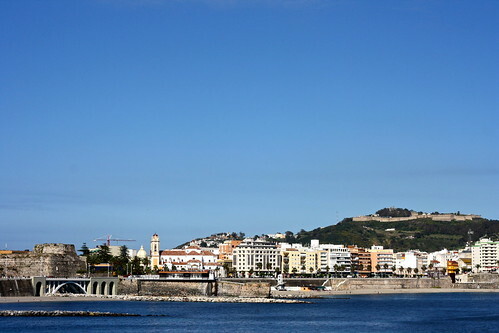 Until the 20th century, Ceuta was administered as part of Cádiz province, with which it had strong cultural ties. Is it worth visiting? Like with Melilla above, I would only visit here in transit between Spain and Morocco. For me personally, I appreciated having the border crossing and the ferry ride experiences separate, since it’s confusing enough as it is to figure out where to go and where to check-in for the ferry in Spanish! Plus, the Lonely Planet said Ceuta is a much more chill city to enter Africa at than Tangier—a popular ferry port with links with Tarifa and Algeciras. And like Melilla, Ceuta has its fair share of churches and museums that are probably interesting (and a fort, too!) but I just didn’t have enough time to devote to sightseeing. How do you get there? From Spain, you can take the 55-minute ferry from Algeciras…or you can ride a helicopter from either Algeciras or Málaga to the local helipad! 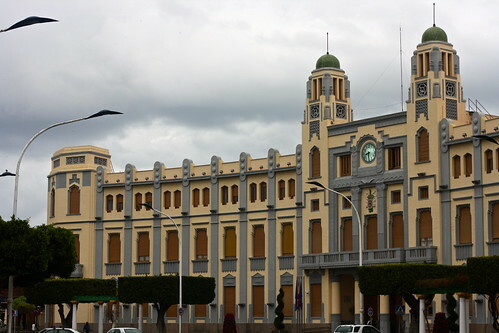 Coming from Morocco, you’ll have to take the bus or hitch a ride in some sort of grand or petit taxi combination leaving from Tangier or Tetouan to the border town of Fnideq. Tell your driver you want to go to “Sebtah,” the Arabic name for Ceuta. 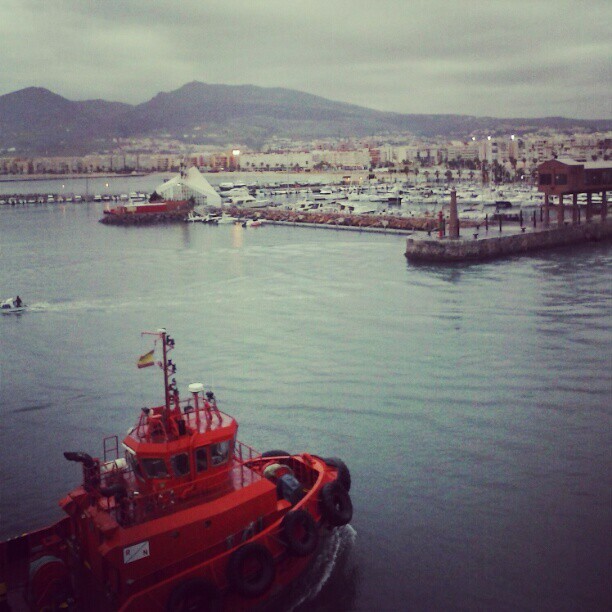 Have you ever been to Ceuta or Melilla? What other geographic oddities can you think of? Comment below! For more pictures, check out my sets on Flickr here and here.